Eurodragster.com Home and News sponsor and Blogger Derek Flynn has cancelled in some style his plan to sit out the rest of the 2008 season. Derek intended to take a break to regroup after the termination of his Top Fuel Dragster rental deal with Knut Söderquist but he called Eurodragster.com from the USA this evening to announce the turnkey purchase of an injected-nitro Top Methanol Dragster. "Having looked at three cars I have bought Larry Miersch's A/Fuel Dragster", said Derek. "We are all very excited and I am a lot more content owning my own stuff. We are hoping that the car will arrive in time to run at Hockenheim in August, and Larry and his Crew Chief Jim Rizzoli will be coming over to teach me how to drive the car and to help us to tune it." The car has been a consistent low five-second runner in the USA. The Spitzer chassis totes a Brad Anderson billet block and BAE heads and a Hogan injector, and is equipped with a one-piece carbon fibre body. Larry's team have been experimenting with Top Fuel tyres on the dragster and Derek said that he plans to continue with that. "I would like to thank Mats Björklund and Howard Main for their hospitality and assistance when I looked at their cars, but the nitro won out in the end", added Derek. 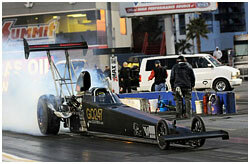 Original article taken from Eurodragster.com.